Our new adventure begins on Monday! 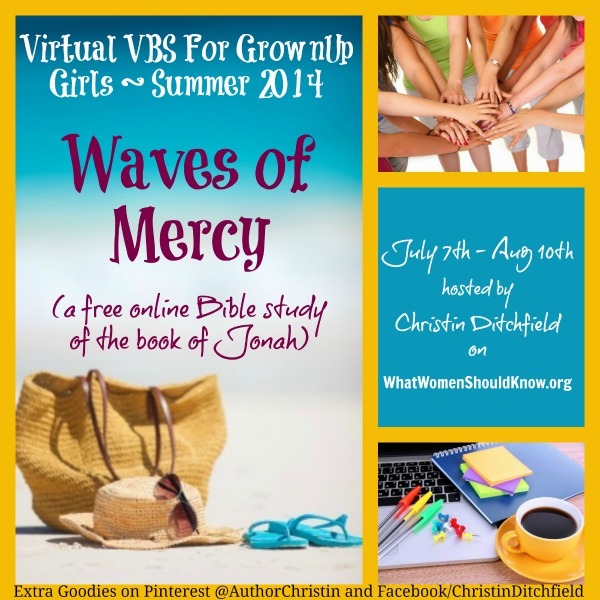 Here’s everything you need to know about Virtual VBS for GrownUp Girls 2014: Waves of Mercy. When: July 7th – August 10th, 2014 ~ five fabulous weeks this summer! Where: At the corner of www.WhatWomenShouldKnow.org and wherever you are! Why: To have a fresh encounter with Jesus through an in-depth study of the book of Jonah. How: Each week we’ll read a chapter of the book of Jonah, along with other relevant portions of Scripture. On Mondays, I’ll post which chapters we’re reading and suggest a memory verse for each week. On Mondays & Thursdays, I’ll post some devotional reading/ teaching based on what God is teaching me, along with some questions for further study and reflection. In the comments section after each post, we’ll talk — like we’re sitting around the picnic table, making crafts and sharing what’s on our hearts. We might even post some craft ideas or recipes or links to our favorite worship songs on Fridays, just for fun! Who: You! Me! And as many friends as we can get to join us! Please help me spread the word… because the more, the merrier! Last year, one friend got a group together and they actually met in person each week, which is wonderful. If you’re able to do something like that, let me know and we might even be able to set up a Skype call – I’d love to say hi to your group personally! NOTE: There’s no registration… you don’t have to sign up anywhere to participate. But you’ll want to subscribe to the blog via email or RSS (see the top right corner of this page) so that you don’t miss any posts. On my Facebook page in my photo album, you’ll find a Waves of Mercy cover photo you’re welcome to use if you like. (I’m using it myself as my cover photo.) On Pinterest, I have a special board for our Virtual VBS – I’ll be adding the pins I’ve made for each of our memory verses… with more free goodies, printables, and downloads to come! The Book of Jonah: It’s a whale of tale! A story that at first glance is all about judgment. But take another look and you’ll see: it’s absolutely full to overflowing, practically bursting with mercy! God’s mercy to Jonah, from the beginning of his story to the end, His mercy to people everywhere – in every generation, His mercy to you and me. Waves and waves of mercy. I think it’s especially powerful, especially relevant to us in our time… and in the days to come, I’ll tell you why!